5 Expired ​Tumblr PA 32 Blogs With 50+ Backlinks! I will also register them under 1 email account. BONUS: Each Tumblr will have a Profile Image! It gets no better then this! As you probably already know, the most important factor is not PA (Page Authority), but backlinks! They're bring all the power and juice to your money site and help rank it.Period! Without them, the PA will eventually drop and the Tumblr blog will become worthless! 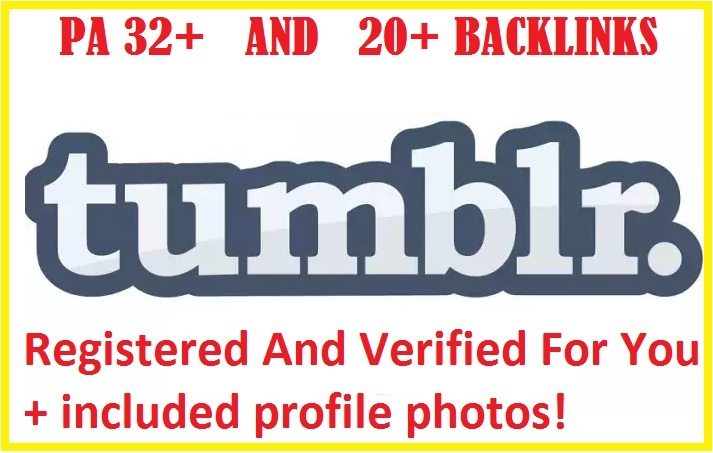 Get 5 Expired Tumblr PA32 With 50+ Backlinks Registered is ranked 5 out of 5. Based on 104 user reviews.